I love email spam. I can have Russian, Asian women, a vehicle warranty and more hair. I always click on them and open all the links provided. Strangely I have to buy a new computer every week. I do miss the Nigerian prince who wants me to hold onto 85 million for him. I only have to provide my bank account and access code. What could go wrong? you must have yahoo mail– a total spam magnet. 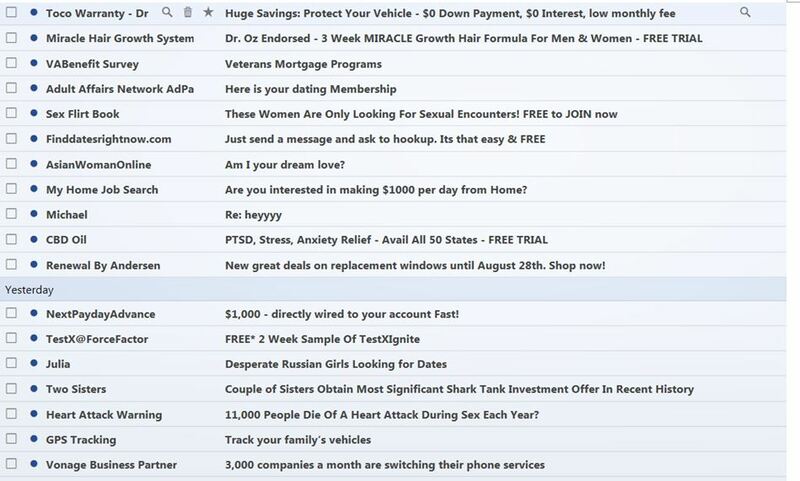 My first yahoo mail was flooded every day, the spammers sell & resell the email addresses harvested from wherever. I closed my first yahoo acct the day I got 123 spams in one day…Strangely, gmail gets very little..
Yup it’s Yahoo. There are many reasons why I hate Yahoo. The ads they load onto the email page always panics my computer into looking for software updates to run the ad. Yes the spam is amazing. I see so much crap from day to day usually upwards of 30-50 a day. I get a kick out of many. It was my third email account after AOL and Netscpae. I’ve had it for over 20 years. Wow 20 years. That is funny and so like Yahoo. I have a couple of gmail accounts but my paranoia won’t let me get rid of Yahoo. I swear everything online is tracked. I’d like to see what my online profile really looks like. Or maybe not. I don’t even use my real name on line, I’ve used Kate Quinn for around 8 years so now it’s part of my self-image identity… once I started to sign something as that name haha. I will happily send you an electronic copy of my new book “Wise Things My Granny Said” for no charge as the p.d.f will harvest youre bank details automatically. Out of sheer sadness I did a follow up and googled grow youre own hair. More hair is good and leads to untold wealth and eternal happiness it would seem. So funny. If you get a million people to sign up for a dollar a piece you might make some money. I tried to sell a gravity subscription once at .25 cents a month. No takers I might try again. All I need is a few million people to send in a quarter. I could guarantee that gravity will remain stable on a month by month basis. No. I missed the bit you got. Reason to buy. I think we should start bottling it and selling it. Gravity granules. Which includes a free gravitational graviton rod. When consumed garviton gravity magnets can be placed in the desired location for instant effect. Cure headaches, stress, increase the size of youre breasts. Attract more hair and more Nigerian Princes etc. etc. This really made me laugh! The Prince must be on holiday. Haven’t heard from him in quite some time. I read somewhere that that particular spammer was busted and he wasn’t even from Nigeria. Jeez if you can’t trust a fake Nigeria Prince, well what’s next uncaring politicians? Oops went a little political. This cracked me up .. Seriosuly What could go wrong .. 😀 Poor Nigerian.